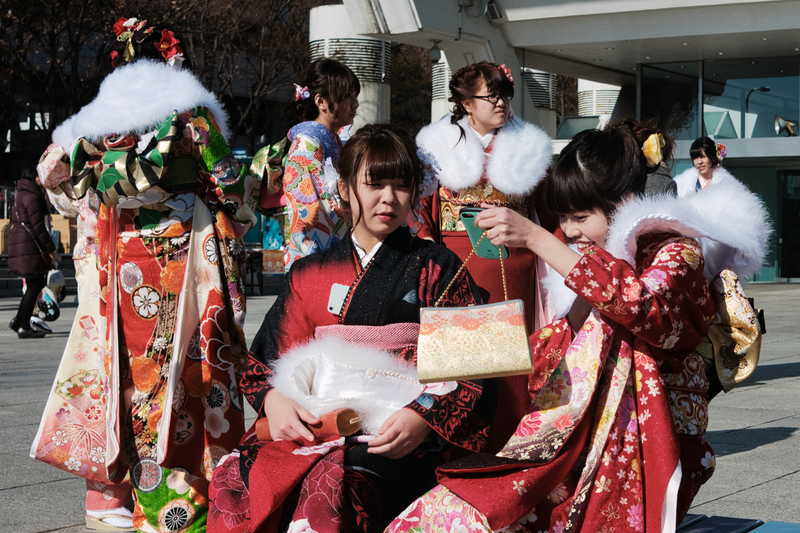 In recent years, traditional kimono are rarely seen on the streets of Japan. Typically, they’re refined uniforms for bar and restaurant hostesses, ceremonial wear for weddings, funerals and the like, and the dress of choice for certain aficionados. But each year things are quite different on the second Monday in January. Seijin no Hi. Coming of age day, when all the twenty year olds in Japan are officially celebrated as adults; when the men don smart suits or the occasional haori and hakama ensemble and the women, their hair elegantly coiffed, join them at the local city halls and after-parties in their gorgeous furisode, parading on the city streets like exotic birds of paradise. The day is a holiday throughout the country, and it’s a perfect day to be out strolling.